Patrick Blanc specializes in vertical gardens: verdant patches that climb the walls of office buildings, shopping malls, museums and public spaces around the globe. 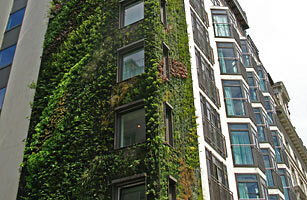 His newest creation is the green-bearded exterior of the Athenaeum Hotel, on which some 260 species of plants (more than 12,000 in all) form a forest façade rising eight stories over London's ritzy Mayfair district. Recognizing that not all plants need soil to grow, Blanc affixes synthetic felt to a frame onto which roots can cling. Part gardener, part botanist, Blanc uses automated irrigation and fertilization systems to keep his specimens healthy and arranges them so that each enjoys optimal growth conditions.